I am sitting in my bedroom with the doors shut, TV off, no distractions whatsoever writing tutorials on some upcoming projects! If I had had some chain and a lock, I would probably try to bolt myself to the chair! I would also probably find a way to pick the lock and mosey back to my studio to craft...I'm at my deadline now for THREE projects and its time to sit down and try to make out what exactly I did from the notes and measurements I scribbled along the way! God Help Me! So I decided to blog! LOL! Toadstool Cottages In A Woodland...See I'm getting all Dylusional! LOL! Supplies I used for this tag may be found at Inspiration Emporium here in the US and Art From The Heart in the UK. The first thing I did was to spray the tag with puddles of Cut Grass and Melted Chocolate spray inks. 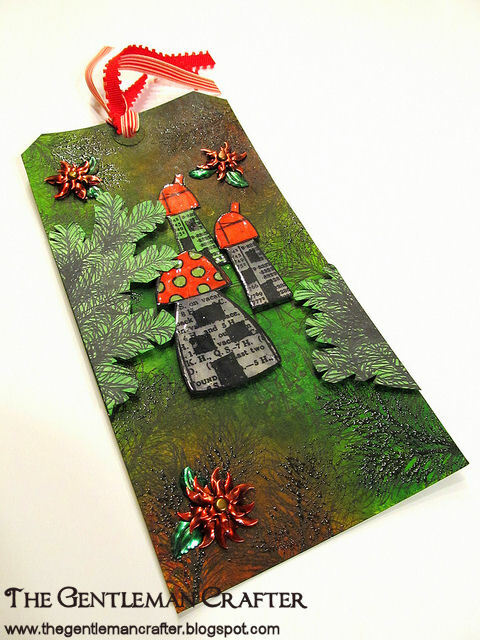 Next, I used the background trees stamp and stamped them randomly on the inked tag. I used the pine tree spray stamp and stamped around the edges. I then used Vintage Photo with the same stamp and stamped over the pine branches. Next, I applied the Ultra Thick Embossing Enamel (UTEE) on top of the vintage photo ink and melted it. I then took the Toadstool Houses stamps and stamped them onto Ranger Manilla cardstock. I colored them and cut them out. I then used the UTEE once again and embossed the three houses and adhered them to the center of the tag. I once again used the pine tree stamp and stamped out a cluster of the pine branches on Ranger Manilla cardstock and colored and cut those out. I then applied those with a few dimensional pieces to the edges of the tag. Last, I inked the Festive Foliage metal pieces and my hands mind you with The Cranberry Alcohol ink and applied them to the tag....That's it! Thank You for stopping by! I have a Fall Tim Tag for you tomorrow! Love the colors. And the toadstools. All is awesome. thanks as always for sharing. Way cool, Jimbo! I love the tag.....oh, BTW, guess who's spending the day with Queen Reaveley this Sunday? C'mon...guess! YUP! I am taking a workshop with her at the Queen's Ink in Savage, MD! I can't wait! I'll be sure and tell her I knew you when.... Thanks for sharing your tag. Looking forward to the Tim tag next! Love everything about this tag... The colors are the thing that caught my interests. Hope your week going well? Look forward to more of your work. I Love the way you get side tracked .. Good intentions and getting on with work ONLY to have a breakout doing the crafty thing instead...Thank goodness you did, Love ya Tag man! Look forward to being inspired by more of your work .. Laters .. M.
Can I ask a question? When I make tags, they look fine on the front but the back! How do you finish the back side of the tag. I find the ink I use on the front puddles under the tag and it just looks messy :( Is this something I should investigate on You Tube? 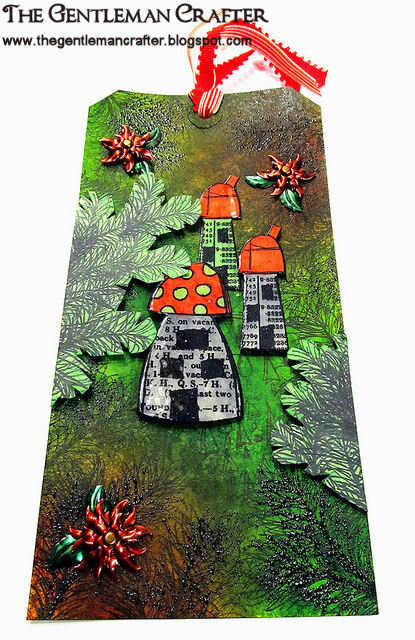 Whimsical and beautiful...love those toadstools. Love the new background on your blog as well. Loving the color and texture combo on this tag. Thanks for sharing. Btw, I too love the new background. What a cute tag! I love the little poinsetta looking flowers. I am now the proud owner of 6 dylusions sprays. After this week I can actually use them because my other project is done! Can't wait to see more. So cute!!! Love how you work...don't know how you keep everything straight but the more distracted you are the more fun we all have...LOL!!! Keep forgetting to say...love the new blog background. Nice tag love the metal flowers. I do have to say that they do resemble toadstools but the back two remind me of Daleks from Dr. Who. Is that a bad thing???? Keep the tags coming! Lovely tag, looking forward to seeing more. I like this background but the autumn one was my favourite. Absolutely love those glorious colours . . . not something we get much of here in Western Australia. I hope you're making good progress with those tutorials so that you can get back to the craft room asap! Love it! Never really paid much attention to the festive foliage before in the shops, but coloured they look amazing! Adding the Right Up Your Street to the Santa list-love the whimsy of this tag. Tagalicious! I get easily distracted too - where did I put my cup of tea? !